*Follow me on Twitter here. It was a hell of a day for two sporting giants at the Olympics Sunday; one we all expected to be standing atop him sport, the other a pretty pleasant surprise. 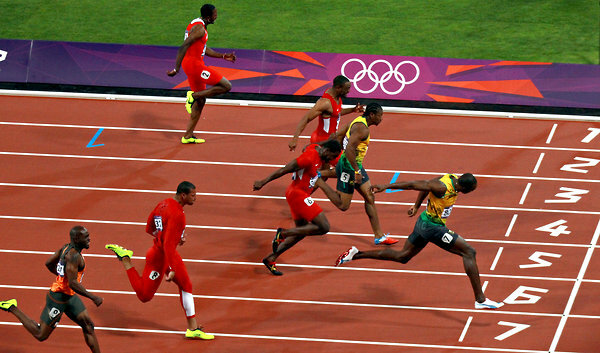 Bolt is why we watch the Olympics; to see someone so superhuman raise their game just a little higher. Sure, the luster came off the Jamaican a little this year when he lost in the Olympic Trials, but Sunday the fastest man on Earth was back on top. Bolt (and again, could any Hollywood screenwriter come up with a better surname for track star?) blew away the field in the 100, winning in 9.63 seconds, a new Olympic record. Amazing. The other hero Sunday was Andy Murray. Even being as big a Roger Federer fan as I am, I was happy for the long-suffering, and long-underachieving Scottish star. Always getting close but never quite winning the big matches, the UK’s best tennis player in decades thrashed Federer at Centre Court, losing just nine games and winning a gold medal. It’s not a Grand Slam win, which Murray desperately seeks, but it was pretty terrific and moving, nonetheless. On a related note, God I love the Olympics. **Got a super book recommendation for you, if you’re a baseball fan, or just a fan of great writing. 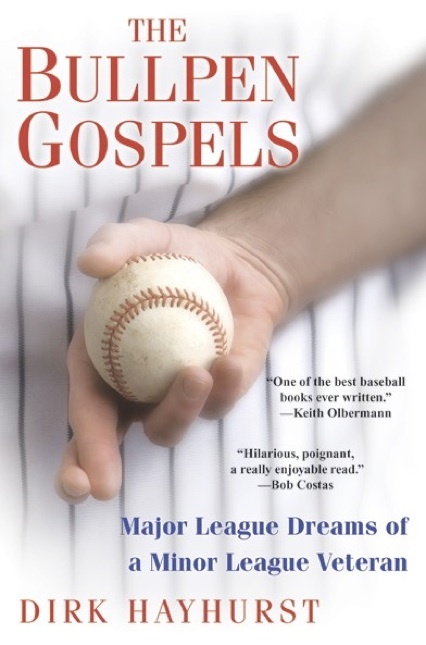 A couple of years ago a career minor-league pitcher named Dirk Hayhurst wrote the fabulous “The Bullpen Gospels,” a book about a year in the minors that touched on so much more than baseball. It was smart, it was funny, it was touching (read more about it here) and I highly recommend it. 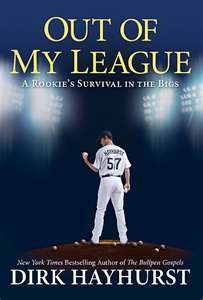 This spring Hayhurst wrote a sequel, called “Out of My League.” It’s about his 2008 season, which finds him finally in Triple-A, madly in love with a woman, his alcoholic brother finally sober, and Dirk waiting desperately for a call to the bigs. When it finally comes, you expect he’ll be thrilled, and celebrate, and cherish every day in the majors. But it doesn’t turn out that way, and this is where an already-fabulous book gets even better. Hayhurst beautifully writes about the moments when your dreams come true, only to open the door to crushing, soul-sucking failure. **Haven’t come across any “man, they are so crazy in Italy” stories in a while, partly because everyone’s favorite punchline across the Ocean, Silvio Burlesconi, isn’t in charge there anymore. But this story caught me as pretty bizarre: A new law has been passed making it illegal to utter the phrase “You don’t have the balls,” in Italy. Apparently a man took his cousin to court for questioning his manhood by, well, questioning the size of his testicles. 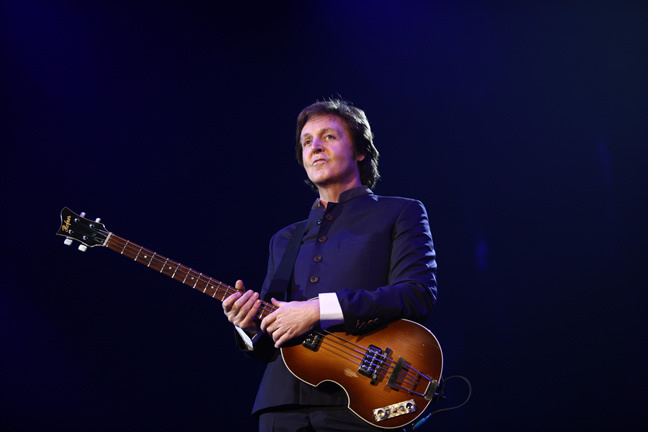 And an appeals court ruled that, well, you can’t say a man is less than a man! Not sure this law would hold up in America; We might have 50 million arrests at bars across the country every weekend.